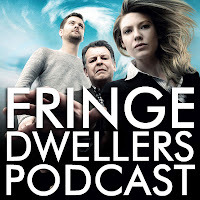 In the fifth of the Fringe Dwellers Podcast, Jen and Adele gleefully discuss the details of the newest Fringe episode, The Ghost Network. We cover the ratings, question the whereabouts of Gene, religious symbolism, Astrid Farnsworth, Boston and new theories (our own and yours)and opinions including our pick for William Bell casting. The accents make sense if you consider that none of the characters are necessarily from Boston. The FBI guys don't get to choose where they're stationed and Walter was in the city for Harvard. The only one who should have a Boston accent is Peter Bishop who probably grew up there.